Affordable Beach Vacations is now at Facebook - "Like" us to keep up with what's New + Post on our Wall! Now at Pinterest as Affordable US Beach Vacations -- Check out our "Cheap" US Beach Vacation Boards + US Historic Lighthouses and other Pins! 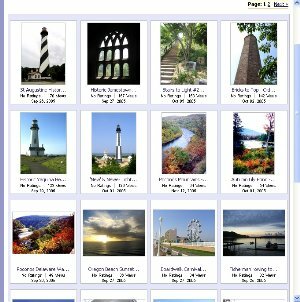 This page has several free pictures of Eastern Florida Lighthouses + one inland Florida Lighthouse. It includes Lighthouse Wallpapers, Screensavers, and printable Historic FL Lighthouse Photos selected from those on this Memorable-Beach-Vacations.com Web Site. Check back for more pictures of East coast Florida Lighthouses and Western Florida Gulf Side Florida Lighhouses to come. 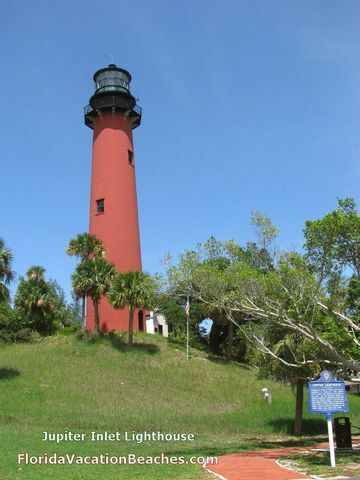 The history of some of these Historic Florida Lighthouses is really interesting! You are welcome to use these copyrighted pictures as long as the domain name text remains visibly displayed unaltered on the Image as it is on the pictures below. Right click any lighthouse photo below to get a file download menu in most newer browsers. 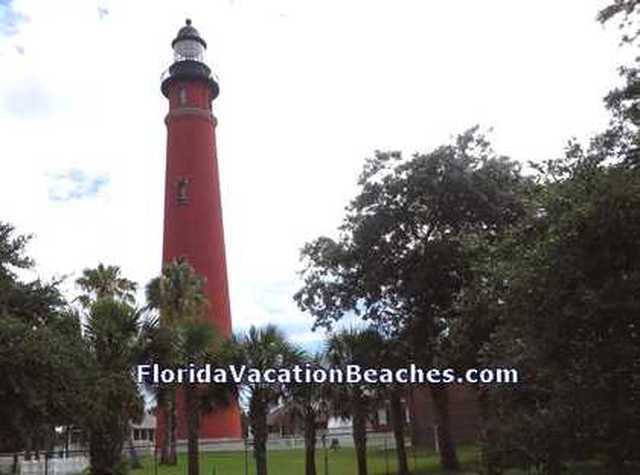 + our other 3 Vacation Web Sites -- see our Thumbnail images free preview box below the Florida Lighthouses pictures. The pictures are set up to easily download to your Windows Desktop, Wallpaper, or Screensaver. Note: The file names on the pictures on this page are a "Mini-Picture-Description" so you should not have to change the file name to be able to identify the picture. If you see other pictures on this web site that you would like to see as downloadable approximately 5 x 7's on one of our computer Wallpapers - Screensavers pages, please let me know on our Gene Seecann Comments, Suggestions, & Favorites Page. Have fun! 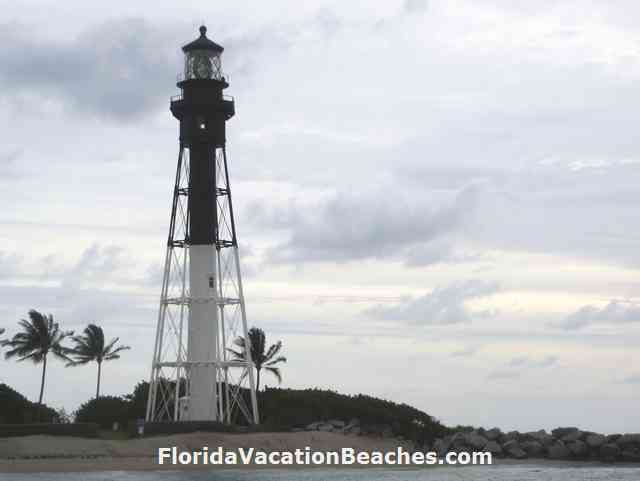 If you have a few great pictures of Florida Lighthouses - particularly Eastern Florida Lighthouses - from a Memorable Florida Beaches vacation, please send us a note on our "Top Picks + Comments & Suggestions" page. All of the approximately 5 x 7 and 4 x 6 Lighthouse Pictures below are about 50K files and should download and save to your computer for a screensaver or walllpaper almost instantly -- IF this web page and images have finished loading in your web browser. See TravelPhotosUSA.com -- for larger size High Resolution Photo Versions of some of these pictures of FL Lighthouses. -- Save on wall art at Art.com! These Eastern Florida Lighthouses pictures are free to download and print or use as Lighthouse Wallpapers or Screensavers as long as the Memorable-Beach-Vacations.com, GoUSBeaches.com, or Florida-Vacation-Beaches.com Domain Name text remains visibly displayed unaltered and readable on the Image. Resale of these Lighthouse images or Lighthouse pictures in any form is a violation of our copyright. See the lavender color Thumbnail Photo Box under the large pictures below if you are interested in any downloadable and printable high resolution 1 to 5+ Meg .jpg large image file versions of some of the Pictures of Florida Light houses below and over 35 others of the favorite Photos on this US Beach Vacations web site and our other 3 US Vacation Guide Sites - see GoUSVacations Link below. You can scroll down to view the Florida Lighthouses Pictures + Facts and History below, or click one of these Lighthouse Photo Links to drop down directly to that particular Florida Lighthouse. at discounts for adding to your Home and Yard Decor. Historic Florida St. Augustine Lighthouse. 165 feet - 14 stories - tall. This "new" replacement brick lighthouse was first lit in 1874. The original wooden Spanish "Watchtower" had been built fairly close by in 1565. The coquina stone Watchtower, guardhouse, and and surrounding wall replaced it in 1683 and the "new" brick Light House in 1874. It is a 219 step climb to the top of the lighthouse for spectacular views of St. Augustine and its beaches -- particularly at sunset. 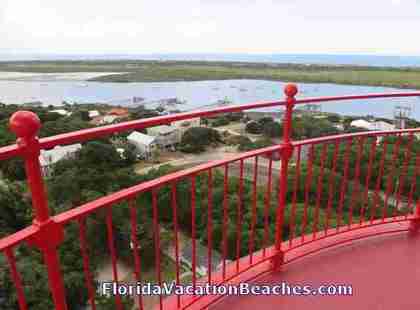 The St Augustine light house open observation deck is about fourteen stories high. The Lighthouse contains an estimated 1.2 million bricks. The light has a first order 9 1/2 feet tall Fresnel lens that contains 370 hand cut prisims in a metal frame. Light keepers used to have the duty every 3 hours of hand "winding" a clock and weight system that rotated the lens as well as carrying whale oil up to the light flame. Whale oil was later changed to kerosene. To more on Florida St. Augustine Attractions Day Trips - "Must Sees," Tips, and Pictures - including the "Must See" Lightner Museum and Historic Alcazar Resort Hotel. Preview a high resolution printable version of this Historic Lighthouse picture at this TravelPhotosUSA High Res Lighthouse Photo Download Preview page with photo download Info. To St Augustine Lighthouse and Museum page, with interesting history on the "St Augustine Light Station" and the three light towers that have been built here + a St. Augustine Light house Picture from the Coast side. Click on the small "B & B and Inns" text link near the top of the page above for Info & User Ratings on over 30 St Augustine area Bed and Breakfasts & Inns on the affordable and scenic Florida east coast. This photo with less vivid colors taken on a cloudy day was actually more popular with people purchasing Stock Photo Downloads at the Site where we used to have our Photo Downloads posted than the Photo Version above this photo taken on a sunny day -- for some unknown reason! A fourteen story - 219 steps - climb to the top for this view! 219 metal steps down from the open viewing deck at the top! Kids love the noisy spiral metal steps -- the ones going down are easier for some reason! Ponce De Leon Inlet Lighthouse was completed in 1887. 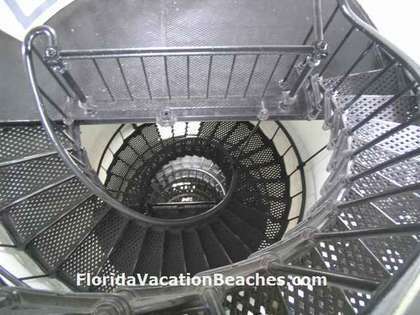 It is the tallest Florida Lighthouse at 175 feet with a 194 step circular stairway. Over one million bricks were used in the Lighthouse construction. The brick foundation goes 12 feet below the ground. The only taller brick lighthouse in the US is the Cape Hatteras Lighthouse on the outer banks of the US East Coast in North Carolina. The Ponce De Leon Lighthouse has an interesting history including it's beginning as a forty-five-foot, conical, brick tower and a dwelling which were hastily completed near the end of February 1835 at a cost of $7,494 at the then called the Mosquito Inlet Lighthouse. Mosquito Inlet was the exit point for two rivers: the Halifax River to the north and the Hillsborough River, later renamed the Indian River, to the south. The name Mosquito Inlet proved a deterrent to more settlement in the area, so the name was officially changed to Ponce de Leon Inlet in honor of the famed explorer, and the lighthouse became the Ponce de Leon Inlet Lighthouse. The first Light Keeper assigned to the Ponce De Leon Inlet Lighthouse station received $450 annually. He initially did not have much to do, however, since Congress had not provided funds for oil for the eleven lamps in his lighthouse lantern room. A a violent storm in October of 1835 washed the dwelling for the Light Keeper into the inlet and undercut the foundation of the tower. Soon after that, the lighthouse was damaged during the Second Seminole Indian War when a raiding party visited the area and damaged the original lighthouse. The light in the current 175 foot tall Lighthouse was first lit on November 1, 1887. The Ponce de Leon Inlet Lighthouse was electrified in 1933. The Coast Guard assumed responsibility for the Florida Ponce de Leon Inlet Light house in 1939 and kept a crew at the station until the lighthouse was fully automated in 1953. More on this Florida Lighthouses Interesting History at this Ponce de Leon Inlet Lighthouse History page -- formerly the Mosquito Inlet Lighthouse. Due to the very limited access to the Cape Canaveral Lighthouse which only allows taking photos once a month on specific dates when/if they are even giving tours, etc., this is a substantially Edited, leveled + cropped and brightened Photo Edited from a Wikimedia Commons Photo that I did not take. This is the Photo credit they ask for -- By Danielrener (Own work) [CC-BY-SA-3.0 (http://creativecommons .org/licenses/by-sa/3.0)] -- Hopefully we will be there on the right day of the month sometime when they are again offering Lighthouse tours to take our own photos of the Cape Canaveral Lighthouse! Lighthouse History: An early 60-foot brick Cape Canaveral lighthouse was built near the site of the current light in 1847. The 1847 light was found to be too short and ineffective to be an aid for ships at sea. Construction began on the current Lighthouse tower but then had to be halted during the Civil War. It was reported that the keeper removed and buried the light apparatus in his orange grove. At the end of the war, construction resumed, and the Cape Canaveral Lighthouse was completed in 1868. In other words, the current Cape Canaveral Light house has been standing on the Cape for almost 150 years. The new tower contained a 1st Order Fresnel Lens and was 145 feet tall and. It is visible for 18 miles. Shore erosion became a problem and by the 1880's the light was only 70 feet from the water. 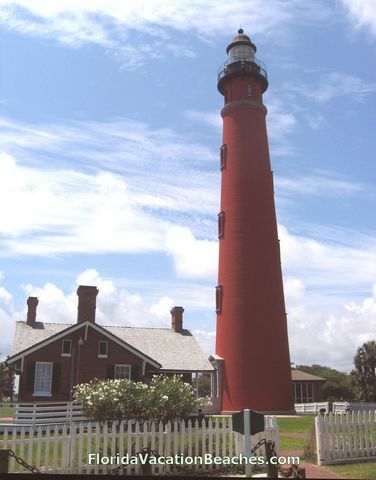 In 1892, relocation began on the Cape Canaveral Lighthouse and took 18 months to complete. In 1960 the light was automated. 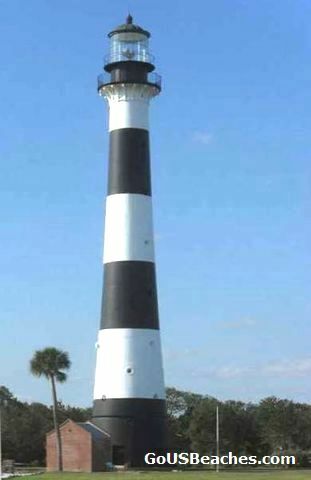 The former lens was removed and is on display at the Ponce de Leon Lighthouse Museum about 12 miles south of Daytona Beach, Florida. The light is active, and is an aid to navigation, but it is not open to the public. The Ownership of Cape Canaveral Lighthouse has been transferred from the Coast Guard to the United States Air Force since it is now on the Cape Canaveral Air Force Base. Check out candid user reviews and see 6 Cape Canaveral Resorts ranked by popularity with comparison pricing at: Find the best deal, compare prices and read what other travelers have to say at TripAdvisor for Cape Canaveral Hotels & Florida Vacation Beach Rentals. Nearby Cocoa Beach Attractions and Points of Interest Info at: Florida Cocoa Beach Attractions. Lighthouse Edited photo version just above this one. 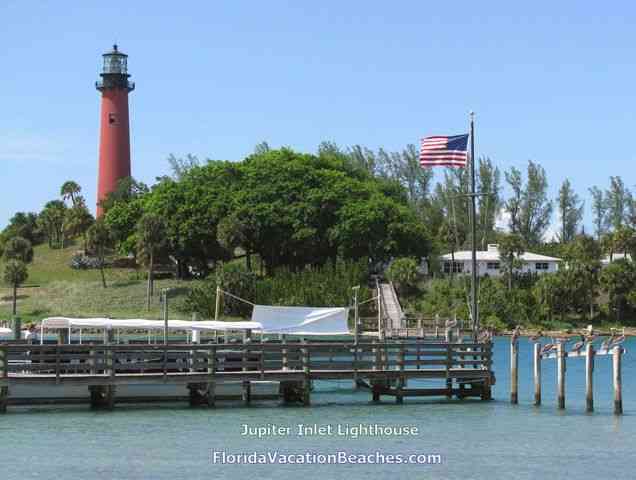 The Jupiter Inlet lighthouse is built on a hill which is a natural parabolic sand dune. The top of the 108-foot tower is 146 feet above sea level. The light is visible 28.8 miles at sea. The movie star Burt Reynolds lived on a large ranch in Jupiter for most of his career - He was a big box office draw during the 1970's and 1980's. 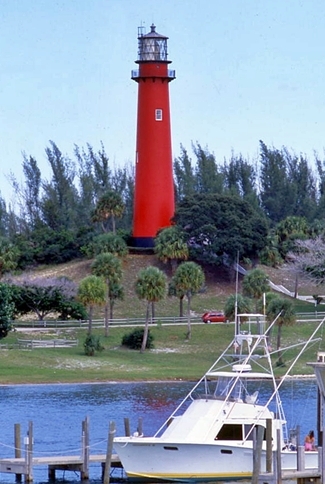 Initially, the Jupiter Inlet Lighthouse was painted bright fire engine red. When the renovation of it was completed in 2000, it ended up the more subdued brick red it is today. More Pictures and comments from our various Scenic Day Trips south from Cocoa Beach, FL, to the Jupiter Inlet Light house and our recommended waterfront Restaurant with a great view of the Lighthouse at this Southeastern USA Road Trip Pictures + Historic Florida Lighthouses Florida Road Trips page. You can see several pelicans sitting on the 5 poles in the water to the right of the flag. The climb to the top isn't so bad for the Florida Jupiter Inlet Lighthouse, since the Lighthouse sits on a 48 foot hill for an overall Lighthouse height of 156 feet tall. The top of the lighthouse is "only" 108 foot above the "hill" level, but you do have to climb the approximately 70 steps up the hill to the lighthouse. Overall, the 105 step climb up the spiral metal lighthouse stairs seems much shorter than the 14 story, 219 step climb to the top of the St Augustine Lighthouse above. 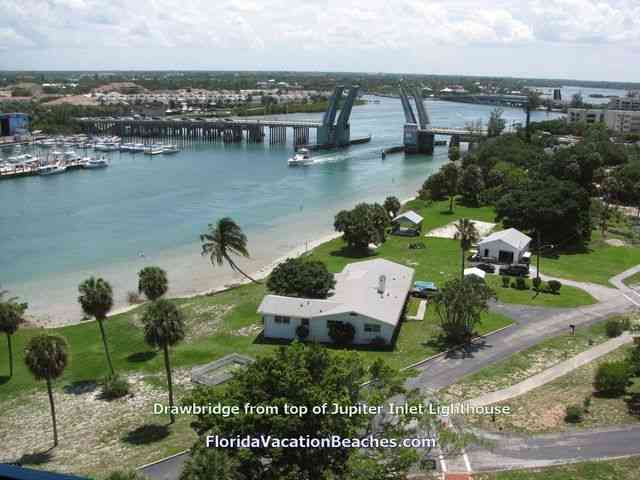 Both the Jupiter Inlet Lighthouse and the St Augustine Lighthouse have a great view at the top! You can see by the photos that I have climbed both. (Actually have now climbed the St Augustine Light house twice!) 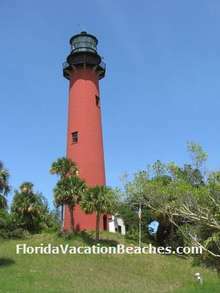 Maybe can climb the Jupiter Inlet Light house again and take more pictures on our next Vacation to Eastern Florida Beaches -- and Lighthouses, since we still have several more Eastern Florida Lighthouses to see and photograph to add to this page. For now at least, am trying to use only my own Florida Lighthouse Photos. 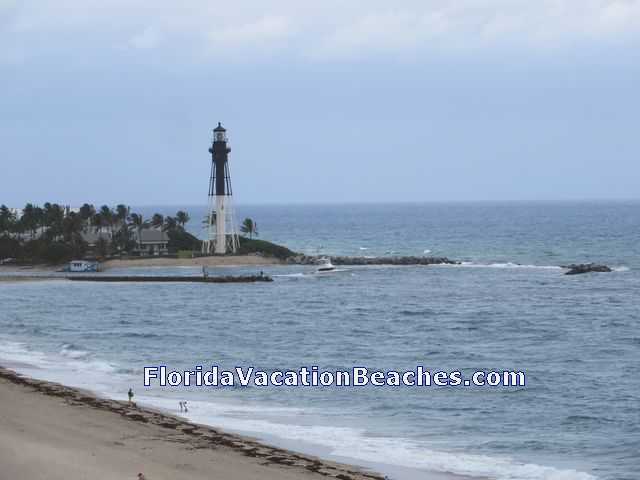 The Hillsboro Inlet Lighthouse is located on the north side of Hillsboro Inlet, about halfway between Fort Lauderdale and Boca Raton, FL, in Hillsboro Beach, Florida. The octagonal iron pyramidal tower was built at a Foundry Company in Detroit, Michigan, and moved to the Hillsboro Inlet Lighthouse Station in 1906. It was lit on March 7, 1907. It was automated in 1974 and the lighthouse now acts both as a coastal aid to navigation, and as a support to local water traffic. and wide angle lens in my then relatively new Canon Powershot SX280 HS Digital Camera. A lot of great features including HD Video packed in a easy to use "pants pocket sized" quality camera! See a more detailed history of the Hillsboro Inlet Lighthouse at this Link. 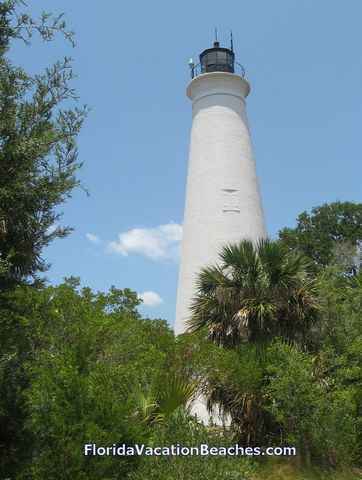 Historic St Mark's Lighthouse and Wildlife Refuge -- about 25 miles south of Tallahassee, Forida. South of Wakulla Springs State Park, FL. 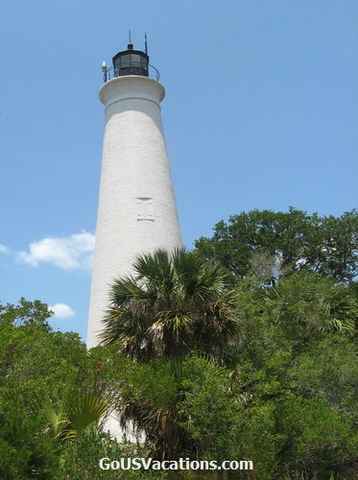 The St. Marks Lighthouse is the second-oldest light station in Florida and was built in 1831. It is located on the east side of the mouth of the St. Marks River, on Apalachee Bay, Florida, USA. The original St. Marks Light house was completed in 1831 after being rebuilt due to a controversy on the construction. 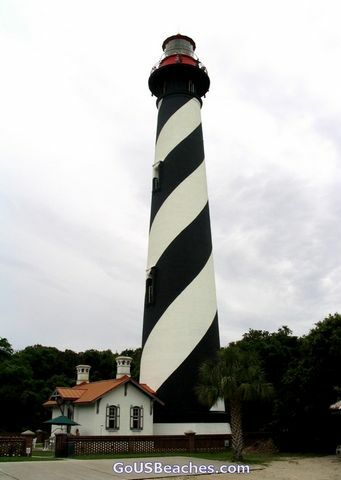 Southeastern USA Road Trip Pictures + Historic Florida Lighthouses at this Florida Road Trips page. 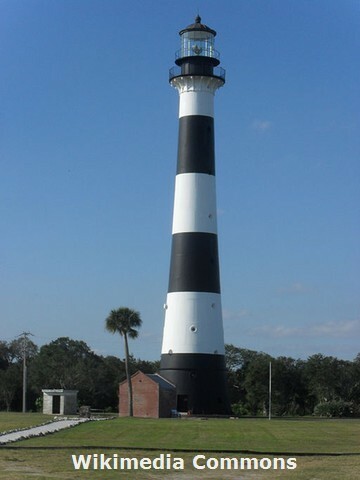 Much more Info and History on the St Marks Lighthouse at the St Marks National Wildlife Refuge and Lighthouse Web Site. Preview high resolution printable versions of this St Marks Historic Florida Lighthouse picture + others at this TravelPhotosUSA High Res Lighthouse Photo Download Preview page with photo download Info. - OR - Browse a wide selection of Lighthouses and Lighthouse Landscape Framed Prints + other Lighthouse Items at discounts for possible additions to your home decor or for yard decorations. A Florida Lighthouse Location Map showing all of the Florida Lighthouses on a large Florida map. Click the name of a Lighthouse on the map for a small Photo + Info and History on that Florida Lighthouse + usually a link to even more details on that Lighthouse -- some links include Lighthouse visit Info and times open. A printable map of Florida Lighthouse locations with the Lighthouse location indicated on the Florida map with a small image of the Lighthouse. Interactive and printable Florida map showing the Lighthouses in Florida -- All of the large red dots on the Map are Florida Lighthouse and Lighthouse Museum locations. Can view list on left with small Images and individual Lighthouse review results + Links to more Info. Hover the small red dots to find some other Florida Lighthouses, but most are just locations with "Lighthouse" in the name. Have your say about what you just read! Please leave a comment in the box below. The above Florida Lighthouses and other pictures on this Site are free to download and print or use as Wallpaper or Screensavers as long as the Memorable-Beach-Vacations.com or GoUSBeaches.com or other of our US Vacation Web Site Domain Names watermark text remains visibly displayed unaltered and readable on the Image. Resale of these images or pictures in any form is a violation of our copyright. Large High Resolution Photo Favorites from our now 4 US Vacation Guide Sites! (See GoUSVacations link at bottom of this box if you want to check those 4 sites out) - High Resolution, Non-Watermarked Photos available for download. You can Preview Large size, High Resolution, Downloadable and Printable / Frameable or Commercially Usable 1 to 5 Meg .jpg file versions of of the special Favorite Photos from all 4 of our "Picture Enhanced" US Vacation Sites. Previews and Complimentary downloads are free. Check them out and you will find that the Royalty-Free High Resolution Photo Download purchase prices are very reasonable. Watch for more Pictures to be added. - Perfect for screensavers or computer wallpaper. If you are a Photographer and would like to sell your Images online at a popular Stock Image Site, see more Info on setting that up at this link - Sell your Photos Online - You set your own image prices. Tip Our GoUSVacations Page has descriptions, page listings, and links to all 4 of our "picture enhanced" US Vacation Guide Web Sites + their Photo pages and "companion" Facebook page links. 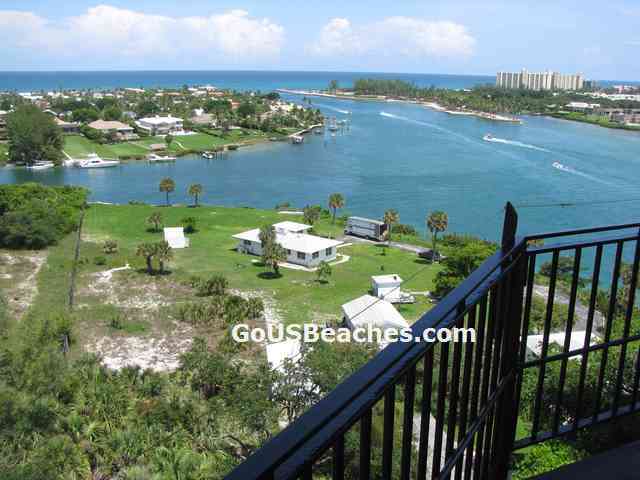 - Example -- our fairly new Affordable Beach Vacations page at Facebook. - 5 Basic Tips we have learned over the years on How to Take Good Photos on Vacations + Travel & Vacation Photography Tips. Attraction Discounts - Many discount travels savings available for those of all ages on family budgets who search them out -- "over 50ers" and the Grey Haired "Seasoned Citizen" set often can get some special discounts we talk about here! (It never hurts to Ask!) Check out this page for some discount travels ideas for All Ages. 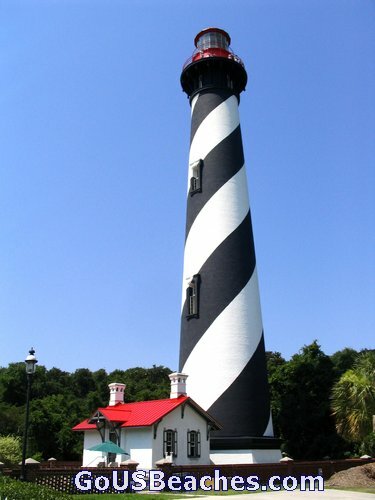 Please feel free to send us any favorite Florida Light Houses pictures which you have discovered that are not mentioned here. Send your Favorites to us on our Comments, Suggestions, & Favorites Page Thanks! Please let me know if I can credit you with your full name and town, First name and town, or other preference. Attached Pictures of Oregon Light Houses, Florida Light Houses, or Virginia Light Houses to go with the comments are always appreciated!!!!! Ever thought about "building" a Web Site of your own? Tip - see a whole page of Free Trial Download e-books on Building Web Sites that can Sell a variety of Products or Services + can see the very popular "Make Your Site Sell" now as a free trial download Web Site Net-selling "Bible."